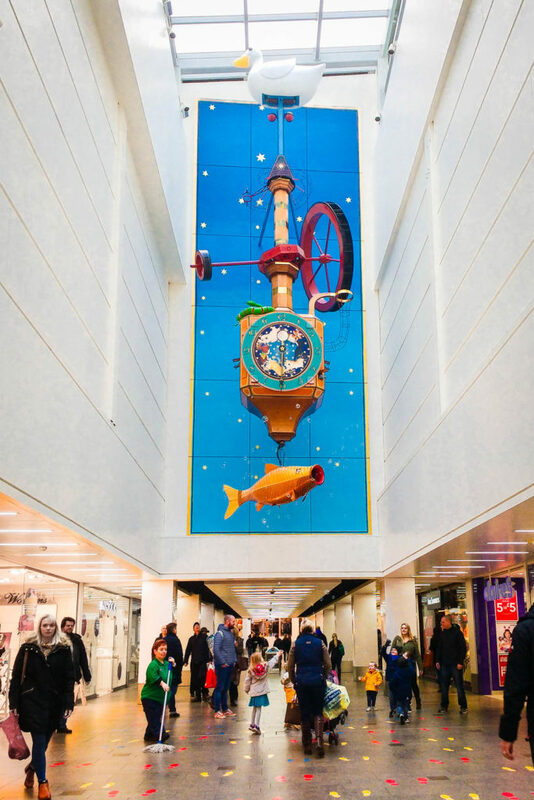 The Bubble, or Wishing Fish, Clock was designed by Kit Williams in 1985 as the centrepiece for the Regent Arcade in Cheltenham. The clock’s mechanism was built by Michael Harding. Fourty-five feet tall, it is said to be the tallest mechanical clock in the world. The clock is the roost of a goose forever laying eggs and home to a family of mice trying to escape a snake. A large fish hangs from the base and blows bubbles every half-hour, to the strains of ‘I’m Forever Blowing Bubbles’. It’s more fun, but less sophisticated, than the scary Chronophage in Cambridge. Both share one essential quality: they are useless for telling the time.